• Offers an adjustment range of 23-33 inches. • Adjusts in 1-inch increments by loosening an oversized knob and then re-tightening. • The inner column is galvanized to resist scratching. Work surface is 40x 24. • Book storage is 14" h x 7" w x 14" d.
Our adjustable desk offers a cost-effective solution for creating accessible desk space in schools. The worksurface tilts from 0 to 50 degrees, offering various positions for accessibility and for rehab activities that require a tilted surface. The front edge features a 1/2" lip to keep books or work materials positioned when the surface is tilted. The laminate top creates ample desk space and the comfort curve enhances accessibility for students who use wheelchairs. 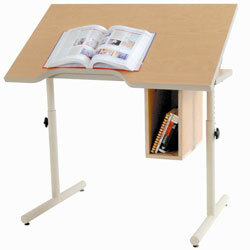 The desk adjusts in height to accommodate multiple age groups and variations in wheelchair sizes and styles. Convenient book storage is placed on the side to maximize knee space. A powder-coated steel base offers years of durability. Standard features: Offers an adjustment range of 23-33 inches. Adjusts in 1-inch increments by loosening an oversized knob and then re-tightening. Durable laminate surfaces. The inner column is galvanized to resist scratching. Work surface is 40x 24. Book storage is 14 h x 7 w x 14 d.